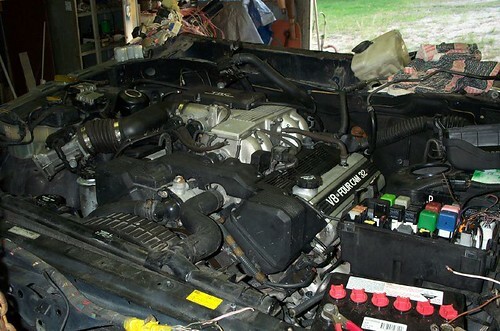 I thought after reading about other forum members upgrades and build-ups I thought that I should share my story of my Nissan that is about to have another engine transplant. I brought the Nissan in 1985, from the Local Nissan dealer; I ordered the 86 model, so I had to wait for about 3 months, it was a factory LWB Deluxe with Auto. 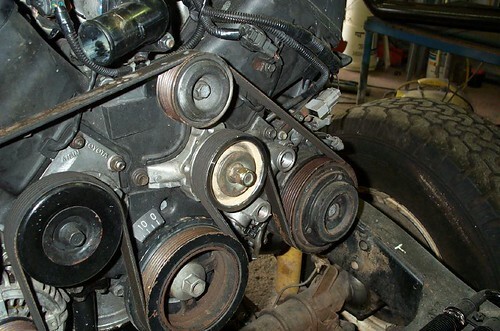 Here in, was why I started down the road of 4x4 modification. 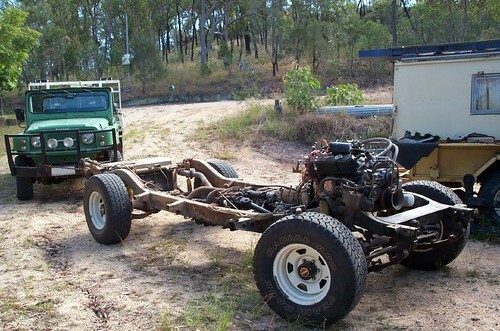 The original engine was the L28 motor with a three speed auto, from new I found this engine was not going to meet my expectations, I felt that the engine couldn't pull the skin of a rice pudding, let alone tow my boat with camping gear. By 1988 I had confirmed this after a trip down through the southern states then up through the center towing my gear, at times I could not get 90 on a flat highway due to the load and winds. So in 1989 I did the first of the upgrades to my Nissan, well I will call it an upgrade others might not agree. 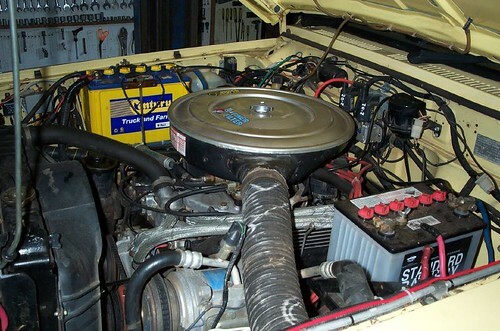 I first fitted a Holden 253 v8 with trymatic into it, which worked well, although fuel economy was not that good around 14 miles per gallon mind you I only ever got 15.5 miles per gallon with the L28 engine. A few years later I fitted a 308. I had a good deal with this, plenty of power, easy to drive and no more expensive than the 253 for fuel. That worked well until some low lifes decided to take my Nissan for a joyride somewhere, on their ride they broke a fan belt, or so they said? They drove it until they seized the engine. This was in 2002. 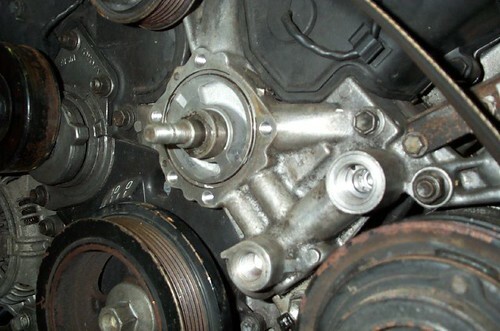 At this time I looked into other options but the problem was with having a remote transfer case, I looked at the Holden v6 with 4 speed auto, but I felt that the gear box sump and housing was to wide, and would not let the front tail shaft through to the front diff. So I decided to go back to a 308, I had it converted to led free, heads ported, yellow terra race rockers and fitted a good cam. This was very good to drive, with plenty of power the only problem being that I would have liked the 4-speed gearbox, as I had 4.6 diffs as at 100km per hour the engine is doing 3000 to 3100 rpm. So this year I have decided to do what I think is the unthinkable as a Nissan owner, after looking around at engines and gearboxes, I have bitten the bullet and brought a Toyota Crown half cut with a Toyota 1UZFE V8 engine and 4 speed auto gear box. So I will now I am hoping to post what I am doing, to build my Nisota. This is what I have had in the Nissan until I started my new conversion. This looks good ,I'm keen to see this done.You must love your car to hold onto it for so long and just change it's Heart. Is the rest of the car still stock Nissan? Cool. I'll be interested to see how you go with it all. Yes it is basically a stock MK Nissan in good condition with only 180,000k on the clock. 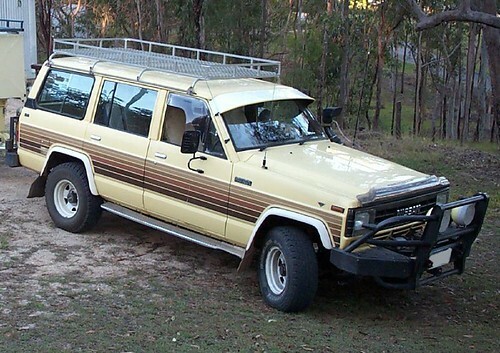 I only use it for fishing and camping trips and trips just traveling having a look around Australia. It just the normal 4x4 accessories like spotlights tow bar, spare tyre rack, jerry can rack, electric 8000lbs Thomas winch, bulbar and I have a 170ltr petrol tank which I made for it 15 years ago, but in this rebuild a few more changes are going to happen. I brought the half cut from down south, I cost me $2985 delivered to Cairns, and I then had to pick it up with the old Nissan Ute. The speedo on the dash was intact so I was able to find out what the mileage was, it said that it had done 84,000klm and I found a service sticker to show that it was serviced at 80,000klm. This I thought should then give me a chance of having a good motor for my conversion. Once I had it in my shed I then started to work out what I am in for. The sump is in the front and I needed it to be at the rear, was the first thing that I found. 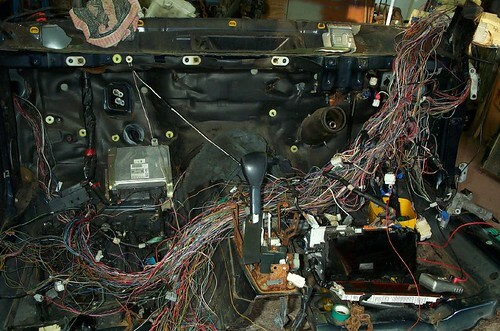 I think that I can make this myself; the next thing is to work on the wiring. My wife and I sat and started to sort out the wiring I would keep, once we got the engine going it was then a mater of removing the rest of the wires and then check that I had not cut one of the wires for the motor. I think that this was the hardest part of the conversion to date, once I did get some wiring diagrams I was then able to work out where each wire went. I spent a good month sorting this out though, I thought that this had to be done first, as I live in North Qld and I could not find local help so this had to be right before I could start to fit it into my Nissan. Interesting choice there ;D are you aware of the lextreme forum it is full of helpful info on these motors. Yes I am aware, I found them helpful, and I am now a member there as well. Lord look at all that spagetti,and that's a computer there as well isn't it? Being colour blind as I am, wouldn't help in that situation at all . I'm up in Speewah in the Tableland's didn't know you were up this way. So you've had the engine for awhile then. I am colourblind as well why did you think I had my wife with me, it was hard enough with both of us. The 1uzfe engine I have has a hydraulic fan, and to drive the fan the engine has a pump built into the front of the engine, I have decided that I will use electric fans as I already have a couple of fans here so the pump has got to go. This pump is a bit of a problem, I have looked on other forums and none of the ways around this I thought was what I wanted, as I do not want to be half way up Cape York on my next barramundi trip and this give me trouble. My main idea is to make the conversion simple and use parts I can get locally or be able to make them myself. 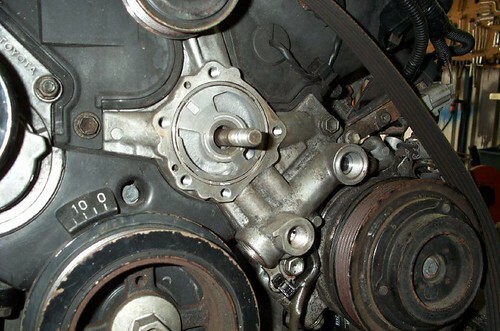 I removed the pump from the engine dismantled it drilled a 9/16 hole through the centre. I then fitted a bolt which I locked to the rear of the pump. I then made a spacer, which is a tight fit into the pump housing. The other end of the spacer I turned it to fit into a pulley from a VN v6 Commodore. The idea is that the spacer carries the weight of the pulley not the bolt, the bolt is there just to keep it tight in the housing of the pump. 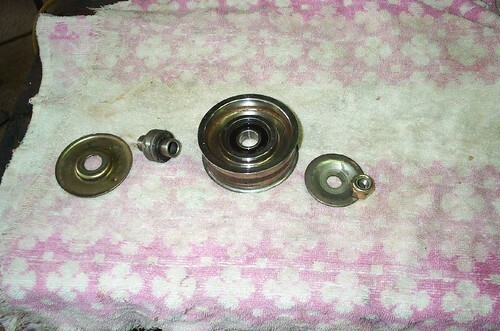 I will use a 25mm smaller belt to drive the system, which I got from my local Repco shop. This is the finished article ready for a test run. While I had the pump of I also fitted a new timing belt, rotor caps and distributor caps as well as new Top Gun spark plug leads. I have also removed the valley cover and cleaned and serviced the starter motor, as this appears a job I would not like to do on the road. Now that I think I have the engine sorted, it is time to start on the Nissan it self. I have a two-post hoist on loan from my brother, so I will use it so lift the cab of the chassis, as I have a few jobs to do on it while I am doing the engine conversion. This is a list of the things I want to do once I take the cab of the chassis, at this stage. Fit an 85ltr mid mounted fuel tank. Replace the 175ltr rear tank with a 145ltr tank, the reason I have to change the tank is for the fuel injection, the old tank has no provision for the high-pressure pick up and return. 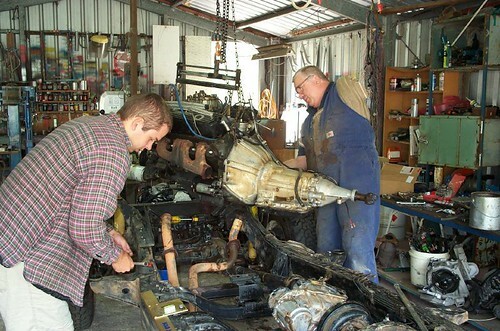 Remove the chassis engine mounts and build new ones to fit the 1uzfe Engine. Do some minor suspension changes to the rear and repairs to the front spring hangers while I have it apart. Do a body lift but only as high as to give clearance for fuel tanks and the new sliders instead of the factory side steps. Cut and modify the inner front mudguards so as to fit the batteries and air filter better. Do a rear quarter panel cut. I will still have to build a new engine sump, and new tail shaft between the gearbox and transfer case. A friend of mine has an idea for this, which I think is a good idea. I will see how well it works out as he is going to make the shaft for me. My son and myself removing the 308, it is now down to business.